Expecting state-of-the-art transport to ease their commuting woes, Mumbaikars are instead facing even more exasperating traffic snarls and blockades. Several transport projects worth over Rs 60,000 crore (Rs 600 billion) have overshot their deadlines and are in various stages of completion. The list includes the metro rail, monorail, elevated rail corridor, Mumbai Trans Harbour Link, Worli-Haji Ali Sea Link, Versova-Bandra Sea Link, coastal road and the Santa Cruz-Chembur Link Road. Ask the Maharashtra government and its undertakings, which include the Mumbai Metropolitan Region Development Authority and Maharashtra State Road Development Corporation, and they say that the delays have been caused due to the time consumed in getting clearances and dealing with procedural disputes. Getting on board people affected by the project also took time, they say. Here's a look at where the projects stand today. 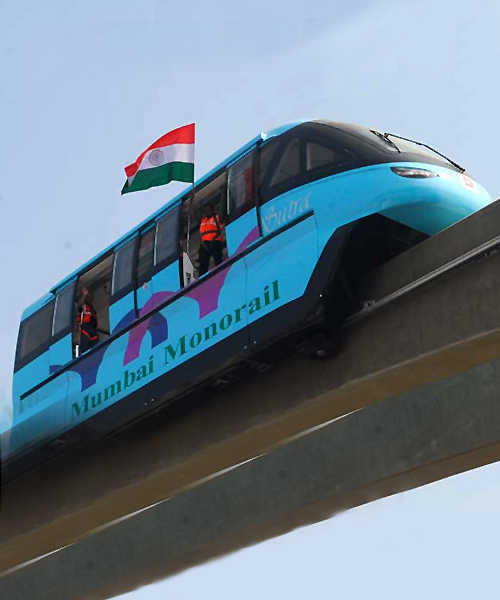 After MMRDA and the state government released its plan to develop 146 km of metro rail network in Mumbai city, the first phase - 11.4 km from Versova to Ghatkopar - was launched with much fanfare in the presence of Prime Minister Manmohan Singh back in 2006. 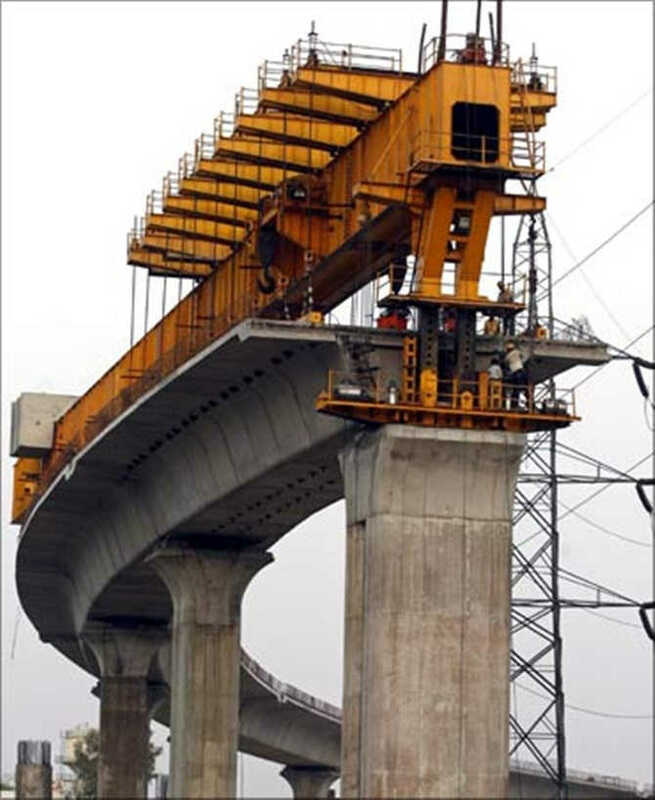 But the project, bagged by the Reliance Infrastructure-promoted Mumbai Metro One Pvt Ltd, has missed the initial deadline of 2012 and overshot new schedules. 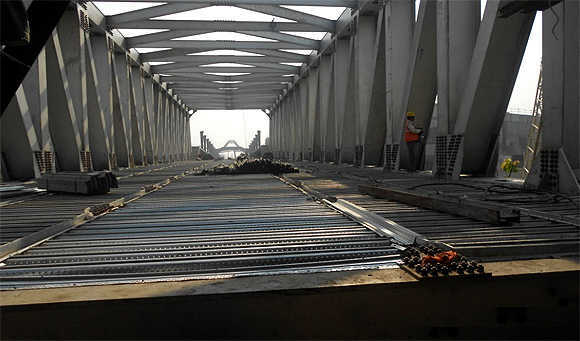 Image: Construction work on the Mumbai Metro line. 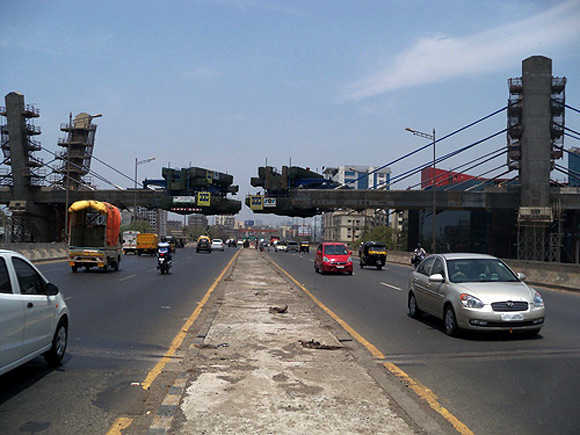 Now MMRDA says the stretch should be up and running by the end of the current fiscal. The project cost, meanwhile, has surged from Rs 2,356 crore (Rs 23.56 billion) to Rs 4,321 crore (Rs 43.21 billion), particularly because of changes in the route, design and plan. As a result, MMOPL has sought a three-fold increase in fare to start and sustain operations. The fare was expected to be between Rs 9 and Rs 13 for different distance slabs. It was to be 1.5 times the fare charged on Brihanmumbai Electric Supply & Transport buses. MMRDA clarifies that there was also a provision to increase the fare by 11 per cent every four years. However, citing the cost escalation, MMRDA has proposed the base fare in the Rs 22-23 bracket. Amidst uncertainty, there came a googly from Chief Minister Prithviraj Chavan who indicated that the state government might take over Mumbai Metro-I. MMRDA says the ball is now in the state government's court which will have to take a call on the fare revision. Besides, the commissioning of Phase I also depends on the safety clearance from the Commissioner of Railway Safety. MMOPL has not yet lost hope. The company's spokesman says, "The first Mumbai Metro project under public-private partnership is progressing well. The project is likely to be commissioned in this financial year barring unforeseen circumstances and subject to receipt of all approvals, including statutory approvals from MMRDA, government of Maharashtra, Railways, and commissioner of Metro Rail Safety." MMOPL justifies its request for increasing the fare saying that it is in line with the basic premise of fare-fixation as provided in the detailed project report issued by Maharashtra government and MMRDA. Besides, even after the increase, the metro fare will be comparable with fares of other metro services in the country such as Delhi Metro Rail Corporation and Bangalore Metro, it says. Now, come to the 32 km Charkop-Bandra-Mankhurd Mumbai Metro-II line for which former president, Pratibha Patil, laid the foundation stone in August 2009. Four years down the line, as the deadlock continues over obtaining critical clearances, Reliance Infrastructure, which had bagged the project and had signed the concession agreement in 2010, might just pull out of it. With lack of clarity on the allocation of an alternate space for depot land, the project might even be abandoned. 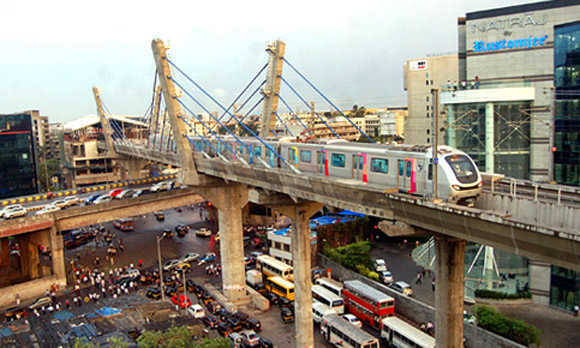 Last month, MMRDA invited bids for the Rs 23,126-crore (Rs 231.26 billion) Colaba-Bandra-Seepz Metro-III. The 33.5-km corridor will have 26 underground stations. The Japan International Cooperation Agency is providing a loan for 57.2 per cent of the project cost for a 30-year tenure at an annual interest rate of 1.4 per cent. The Central and state governments are contributing equity of 10.4 per cent each and a subordinate debt of 4.4 per cent and 7 per cent of the project cost, respectively. However, MMOPL argues that MMRDA is yet to fulfil the condition precedents according to the concession agreement, such as providing unencumbered right-of-way and environmental clearance for depot land. According to the company's spokesman, MMOPL has completed all the activity necessary for the project take off. However, MMRDA will have to tackle the opposition from various non-governmental organisations and citizen bodies that are against the underground phase. 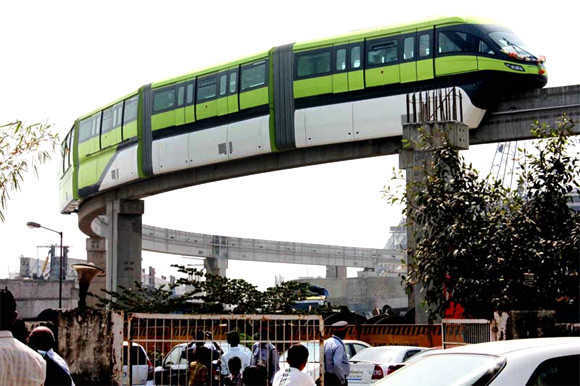 The Rs 2,460-crore (Rs 24.6 billion) monorail project, which was to be complete in 2010 and later rescheduled for December 2012, is still under construction. The first phase of 8.8km, expected to be opened to passengers by the middle of September this year, will now be ready in November. The second phase of 10.74km will be operational by August next year. The project was hit by delay in environment and railway clearances, relocation of religious structures and issues relating to right of way. Sushil Jiwarajka, former chairman of Federation of Indian Chambers of Commerce and Industry's western region, says that virtually every infrastructure project is getting delayed by a few years. "Whether it is the metro or the airport, all are facing one hurdle or the other. The inland waterway which could have brought huge relief to the people has been mired in controversy for several years. The extension of the sea link and the Peddar Road flyover are other examples of inordinate delay," he says. The Rs 9,360-crore (Rs 93.6 billion) Mumbai Trans Harbour Link hasn't even taken off. Despite three rounds of bidding, there are no takers for it. 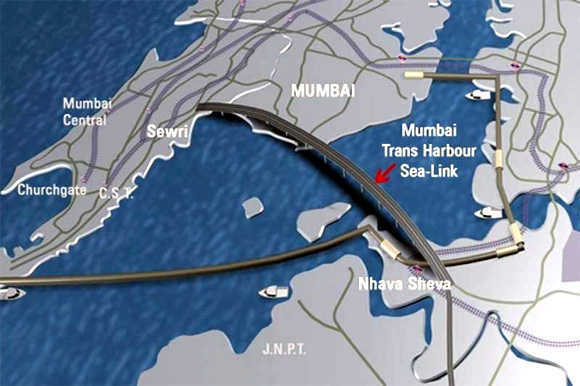 The project, also called the Sewri-Nhava Sheva Trans Harbour Link, was earlier tendered in 2008 but later scrapped. Thereafter, it was re-tendered in 2009 but did not receive enough response. After a delay of three years, the project was tendered the third time in 2013, but MMRDA did not receive any bids from the five shortlisted bidders. The Centre had agreed to provide Rs 1,920 crore (Rs 19.2 billion) as viability gap funding. Transport experts have since hit out against the state government's indecisiveness in implementing the project. The current slowdown and the growing risks due to increasing protests against toll collection have forced bidders to think twice before taking part in the bidding process. The government is now considering the engineering, procurement and construction route instead of the build-operate-transfer model. The objective is to ensure the implementation of the project according to specified standards with a fair degree of certainty relating to costs and time while transferring the construction risks to a private sector contractor. This is Chief Minister Chavan's baby. The 35-km coastal road project entails an investment of about Rs 10,000 crore (Rs 100 billion) to provide a freeway connecting south Mumbai with the western suburbs. The proposed coastal road will include sea links, elevated roads and bridges along the western coast. A committee has already submitted its report to the state government. The environment clearance is awaited. However, the government will have to address the issues raised by the fishing community which is opposed to the land reclamation. Ninad Sapre, chairman of the Confederation of Indian Industry, Maharashtra, says that Mumbaikars have to put up with what can be counted as among the worst roads for any major metropolis. This is despite the fact that Mumbai contributes so much to the exchequer. "Around 70 per cent of India's port traffic passes through Mumbai and congestion at ports, especially the Jawaharlal Nehru Port, is endemic and needs immediate attention," he says. The Rs 5,000-crore (Rs 50 billion) Worli-Haji Ali Sea Link project, meanwhile, lies almost abandoned. A formal announcement to this affect is expected from the state government any time. Maharashtra State Road Development Corporation and Reliance Infrastructure, which had bagged the project, have mutually agreed to part ways. The project could not start despite the concession agreement being signed in 2010. The project aims to provide an alternative mode of transport, especially when the services run by BEST, and central and western railways are overcrowded. The 27-year-old plan to use Mumbai’s coastline for a mass rapid transit system is unable to take off due to lack of administrative approvals. The government intends to connect south Mumbai to Borivali and Navi Mumbai. MSRDC had floated tenders and after the contract is awarded, the project is expected to be up and running in two years. About 39 catamaran and hovercraft are expected to be deployed to cater to 80,000 people every day. The non-subsidised ticket could cost Rs 200-250. Arvind Pradhan, director general, Indian Merchants' Chamber, says, "Even after 40 years, the Mumbai Trans Harbour Link is yet to start. Water transport is seen in every developed city of the world but here." The chorus to set up a separate body with the power to get all sanctions and approvals is becoming louder. If a single agency can be made responsible for these infrastructure projects, it will also be accountable for the delays. "If Mumbai has to retain its position as an international city, we need to act with a sense of urgency," says Jiwarajka.